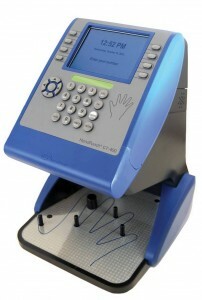 We have several options for biometric timekeeping, typically using a fingerprint scan or hand scan. The employee punch data is sent to the web for supervisor editing and approval either over Ethernet (IP based), an analog phone line (POTS) or though a cellular data connection (real-time wireless). The HandPunch™ GT-400 from Schlage® is a sophisticated timekeeping solution that allows organizations to record and verify an employee’s punch by the size and shape of their hand in real-time. The employee’s hand becomes their badge. 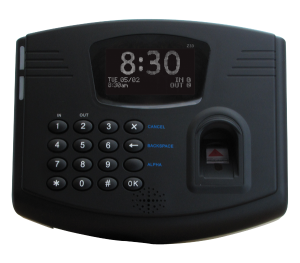 With the FlexClock Z33/Z34, organizations benefit from a time clock that utilizes a built-in biometric fingerprint reader and near real-time connectivity to the Web, all through an affordable device. The Z33 and Z34 timekeeping devices are virtually identical products; however, two distinguishing features exist between these options: the cosmetic “look” of the units (“rounded” vs. “squared”) and the wall-mount option (additional screws provided with the Z34).